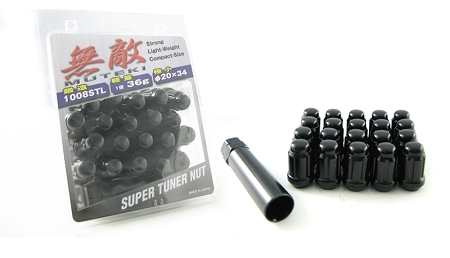 Muteki's compact size and shape fits most tuner wheels with small lug holes and 60 degree taper wheel sets. Each nut weighs only 36g, which is smaller in size than typical nuts at 60g, this reduced weight at each wheel helps improve car driving function. Cold-forged 1008 steel enables Muteki to make the nuts smaller and ligher while still maintaining strength matching or exceeding standard nut specs. M12 x 1.25 application: Fits Subarus, Nissans, etc. NOTE: Lug nuts will not fit factory wheels they are tapered for aftermarket rims only. We will not accept returns on lug nuts fitted to factory rims.